A few days ago I stopped by the Commissary after the gym to get some eggs and milk. I use the gym on the Naval Base the Hubs is stationed at, so the Commissary (it’s what the Navy calls the Grocery Store on base) was convenient. The produce is right at the entrance and I walked right into a display of Spaghetti Squash. Now, don’t ask me why there is a sale on a winter squash (at least I believe it’s a winter squash, correct me if I’m wrong) in June but the commissary can have funny sales like that from time to time. Anyway, I grabbed one and went ahead getting the eggs and milk. I was really good at that quick stop since I really just picked up these three items, instead of coming out with several grocery bags full of stuff, and in the end forgetting the thing I actually went to the store for. 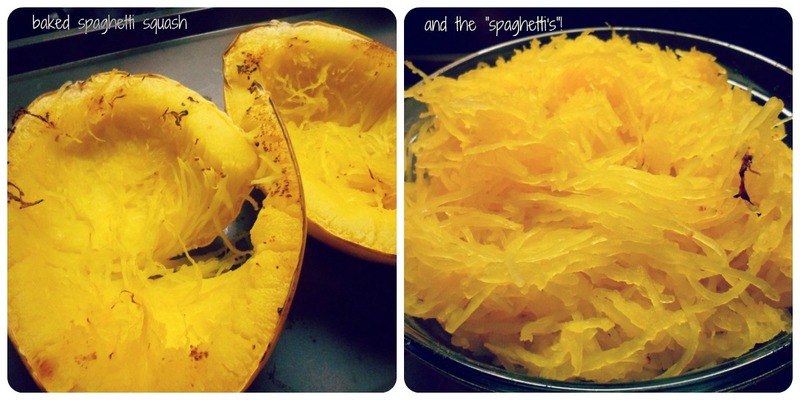 I have had Spaghetti Squash only once a couple of years ago, but I’ve read a lot about it since. I spent some time looking up ways to cook the squash and as it turns out it’s super easy! I was toying with the idea of trying a recipe with a white sauce, but went for the meaty spaghetti sauce I had frozen. I like to make a slow cooked meat sauce from scratch in a big batch and freeze individual portions for a quick, easy and delicious dinner. This was the last of it, so I will be making some sooner and later and I’ll post the recipe then. So much better and healthier than any store-bought sauce! You can bake, boil, steam or microwave the squash. Once cooked, the flesh separates into string like strands like spaghetti. One cup of cooked Spaghetti Squash has only about 42 calories, and 10 grams of Carbs (4gr as sugar) according to the U. S. Department of Agriculture (USDA) nutrient database. A cup of cooked Spaghetti in comparison has about 225 calories, and 43 grams Carbs. 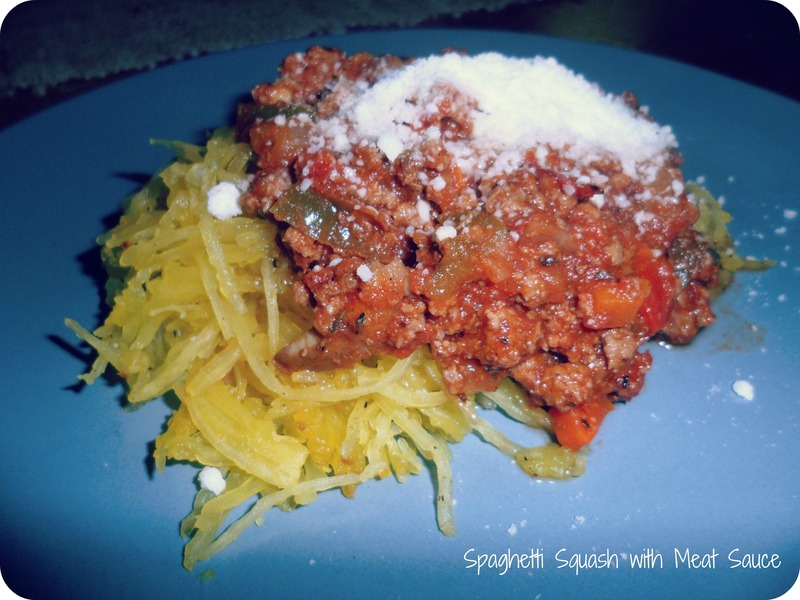 Spaghetti squash has a high water content and is not as dense in vitamins and minerals as other winter squash, but if you’re watching your calorie or carbohydrate intake it makes a great Pasta Substitute. Plus it is delicious ;)! I did add a little salt & pepper to the squash before serving but with the flavorful sauce it wasn’t necessary at all. It was such a delicious, quick, and easy dinner, plus we had enough left overs for both our lunches the next day. I will definitively start experimenting more with spaghetti squash and try it with different sauces. I read it’s also delicious if you just toss the cooked squash with some olive oil, garlic, salt & pepper and some Parmesan in a skillet, hmmmm!